We went up to Mt. 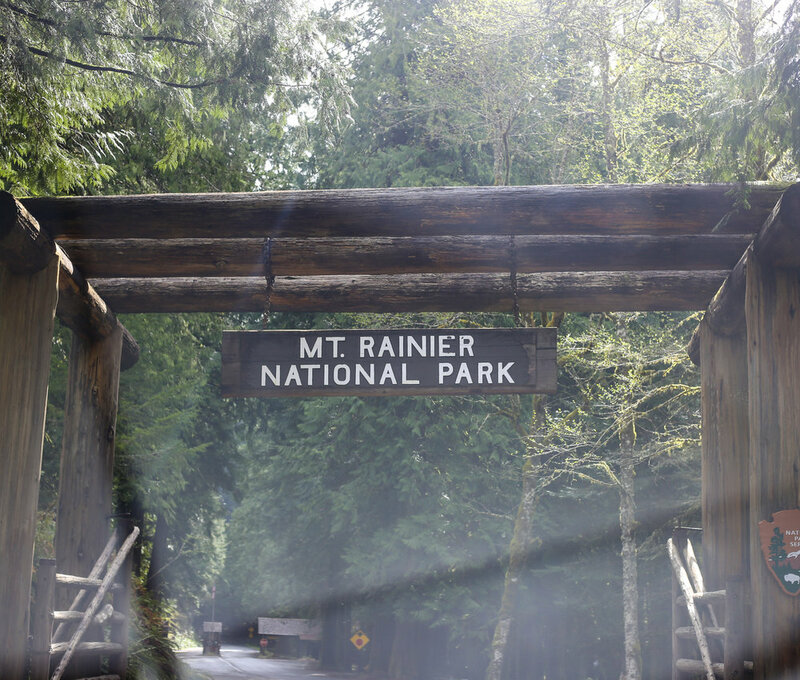 Rainier for the second time on April 29th (first time was last August), hoping that we'd be able to walk a 6 mile trail at an area called Paradise, which is famous for it's amazing views and wildflower meadows. It wasn't much of a floral paradise at all, but it was a winter wonderland! Had we done a bit more research (and read the page I linked above), we would have known that, Paradise is also the prime winter-use area in the park, receiving on average 643 inches (53.6 feet/16.3 meters) of snow a year. As we were driving up the mountain, we started to see bits of snow on the side of the road and we thought maybe they just hadn't melted yet, but as we climbed higher and higher up the mountain the snow on the sides of the road kept increasing until it was eventually a narrow road with (maybe 12 foot) snow walls on the side. We passed a few avalanche warning signs on the way too! It was actually perfect because M’s Mom has never seen snow (maybe just a few flurries). It was so fun to see her excitement. We were in shock too as we drove up the mountain and the snow got taller and taller. After we went to Paradise we headed back down the mountain to the Longmire area, to walk Trail of the Shadows where we saw hot springs (it's the rusty water looking photo below). The hot water dissolves iron as it passes underground, which is the reason for the 'rusty springs'. BEWARE, you're about to be flooded with photos of trees. It was so quiet in the forest, we were a little bit scared that maybe we'd run into a bear (Urso in Portuguese). We made it though (wink wink). We shot lots of awesome photos (with and without snow). Check out the gallery below. Oh and one quick tip, when we go on day long hiking/mountain trips we usually pack sandwiches. It's easy, cheap and you don't have to wait until you find a restaurant (which tends to be hard on a mountain).